Now that August is quickly passing by, my absolute favorite fashion transition is hand by hand. Maybe it's just me, but I find it quite interesting how two seasons that are so contrasting can meet halfway into amazing trends that suit both summer and fall's necessities and fashion ideals. From flowy textures and single-colored patterns to a perfect classy/comfy combination, this year's summer-fall transition is at its best. That said, here is the top 3 list of my favorite fashion trends to wear during both seasons and (hopefully) beyond. 1. Monochromatic look: Remember the white-on-white trend? Apparently, now any color is the new white. Not only you get to look a lot thinner (and taller) but also clean and fashionable head to toe. Wearing a one-color ensemble has been an iconic look for centuries, and like any other fashion staple, it has finally made its comeback. Choosing pieces of the same color gives an instant lift and a very practical slimming effect. What's not to like? Be warned, however, not to match shoes and accessories to the rest of the outfit. Choose a contrasting or neutral tone for footwear and bag for the ultimate chic effect. Images from Canopi and Pinterest. 2. Loose Pants: Speaking of practical? 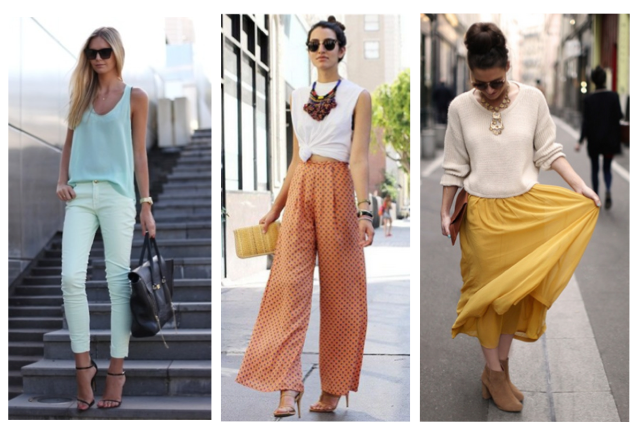 Wide-legged pants. The flowy fabrics in all sorts of patterns and colors with a high-waisted cut are beyond comfortable and fashion-forward. This is the perfect alternative to skinny jeans and cut-out shorts. Loose pants can be both casual and elegant, and are definitely an easy, breezy solution to both warm summer days and chiller autumn's. Images from Love Melrose, The Outfitters and I Want Pretty. 3. Knit + Maxi Skirt: Another plus to both seasons' weathers. Can't argue with maxi skirts being a staple for fall. For me, this is the prettiest, comfiest, most feminine and season-appropriate piece of the entire summer-fall attire. Adding a knit sweater is just the cherry on top. The combination looks effortless yet put-together, a mix hard to get, in my opinion. Can't stress enough how much I love the idea of two loose pieces making such a perfect duo. Images from Sun J., MANGO and Kaleidoscope. Credits: LouLou Magazine, Fashion District, Greetings & Salutations.